Random Burner Hi everyone, Random Burner here with my first CotD for pojo. Today is Lord of D., an interesting card, good or bad, depends on how you use it. Kinda cool card, but is it really good? Well, let's take a look. Let's see, Dragon defense, pretty simple. With Dragon Capture Jar to stop Dragons, they need something to help only Dragons. I know this was supposed to do that, but couldn't they have made it a bit better? I mean, if you're playing Dragons, put it in by all means. It's great defense and should be used whenever you play Dragons, but then again, are Dragons great in LoBEWD? Please don't plan on using this thing to totally scare your opponents into submission. 1200/1100 just doesn't cut it. I mean, even Giant Soldier of Stone and Aqua Madoor, monsters meant for defense, can bring it down. To live, you need to power it up. Unfortunately, it doesn't go along with some Dragons. This is not the best card for attacking or defense, for it self anyway. Though froms its effect you can save a bewd or some other dragon from cards like change of heart raigeki, dark hole, ect. I recommend if used in a deck to put in cards like yami, book of secret arts, sword of dark destrucion to make it have a higher atk. If it is a large part of your deck you should include cards like monster reborn, and remove trap to get it in to play with less of a problem. You can combine this card with the flute of summoning dragon and a couple dragon type monsters (I recommend bewd or some other high powered dragon). You first play your lord of D (beware of trap hole) then play flute of summoning dragon and play your two dragons as special summons. kick the crap out of your enemy. Muahahaha. MUAHAHAHAHA! DESTROY THEM! Erm... sorry. A BEWD would be a massive force to be reckoned with. However..
it works on your opponent to! Teehee. Flute of Dragon Summon's text: Playing this card when you have a Lord of D.
your hand as a Special Summon. win in one turn with the right setup. Casual: 3/5 Since your BEWD might have a chance here sure go ahead. Tourny: 2.5/5 Right now, strong players will make you regret playing him. Ahhh, Lord of D. (Kinda odd how they shortened it... o_O) The easiest way to counter their Dragon Capture Jar. A closer look is in need, however. Four stars makes it easy to get out so thats a plus. 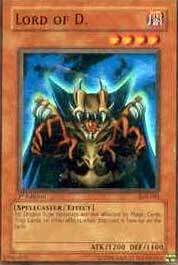 Being a Dark Spellcaster makes it useful if ya want to add a Blue-Eyes White Dragon in your Dark Magician deck (o_O). But as my eyes wander further downward I see it's ATK and DEF power. Then I cry. Yes, it's high for an effect monster, but it should be WAY higher if he is going to be protecting my BEWD. No one should ever run a monster with an ATK less than 1200, excuding effects, so it'll be destroyed for sure. Sure, you can use Equips and Traps to beef him up, but they'll only go so far. I seriously suggest using a De-Trap for Jars over this withered old man. So does he have any use? Well, he is the nessacary component for a decent card- The Flute of Summoning Dragon. Playing this card when you have a Lord of D. card face-up on the field allows you to play up to 2 Dragon-Type cards from your hand as a Special Summon. So you COULD get two Blue-Eyes, White Dragons on the same turn for free. But the chances of that are pretty low, so you'd probably play two lesser dragons, in addition to your normal summon. So you'd get three summons in one turn! That's a full field assuming you had a Dragon out. Or you could play the two dragons, then tribute them for a 7 star. It is definatly worth it to play a Flute if Lord of D. is in your deck. Even with the Flute, I still wouldn't play it. There's simply not enough good dragons out currently. But if you DO run a Dragon deck, by all means, put him with some Flutes in your deck. Lord of D. is good...if your opponent doesn't have any dragons. If your opponent gets a Blue Eyes out, and you have your Lord of D. out, you'll regret. It's pretty hard to take out your own Lord of D., and if they have Dragons out, odds are, you've killed yourself. If your opponent doesn't have Dragons, you've got yourself a strong advantage. Get The Flute of Summon Dragon out with this, and you can play two Blue-Eyes for free! But, if your opponent plays his Flute of Summon Dragon using YOUR Lord of D., it kills you, plain and simple.